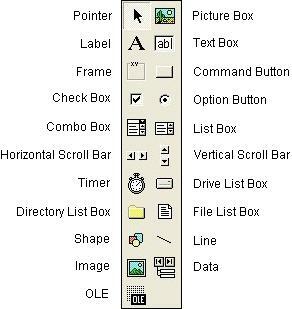 There are many more buttons which can be added to this toolbar, which enable you to insert more advanced controls into your applications, but this basic set is all you need as a beginner. With the Pointer button highlighted, this enables you to select controls on your form by either clicking on them or dragging a rectangle around them. Try inserting a command button into your form by pressing the Command Button button on the controls toolbar and then dragging a rectangle on your form to the size you want your button to appear.